A favourite among children, our Amul Cashew Cookies will be loved by everyone, regardless of their age. 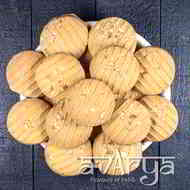 Enriched with the goodness of rich butter and crunchy cashews that help you enhance your metabolism, Avarya brings to you these fine cookies. This pack makes a great gift for your loved ones on special occasions! Amul Cashew Cookies	BK-CO-1334 A favourite among children, our Amul Cashew Cookies will be loved by everyone, regardless of their age. Enriched with the goodness of rich butter and crunchy cashews that help you enhance your metabolism, Avarya brings to you these fine cookies. This pack makes a great gift for your loved ones on special occasions! Refined Wheat Flour, Sugar, Vegetable Fat, Cashew, Raising Agent, Amul Butter, Milk & Iodized Salt. The shelf life of Amul Cashew Cookies is 60 days.